Bring the captivating fragrance of an exotic luxury spa to your home. 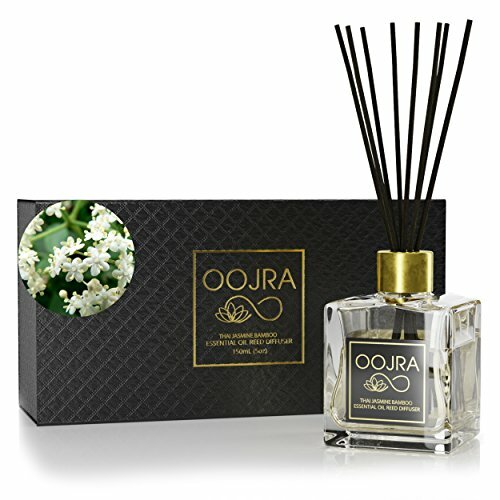 Get the world class feel of luxurious ambiance through the power of scent with Oojra home fragrance essential oils reed diffusers. Oojra scents are inspired by the best exotic scents from around the world. Scent is a powerful memory trigger and an easy way to create relaxation, creativity, energy, romance and more. Give yourself, your family and guest this beautiful experience. This jasmine bamboo scent is all about happy relaxation. Historically jasmine flowers were strung up in bedrooms to create romance and used to improve alertness and work accuracy. The crisp, clean refreshing scent of bamboo is relaxing and adds fresh green woody notes that inspire creativity and calm. The inspiration for the Thai Jasmine Bamboo scent came from a Thai spa in Hua Hin. Guests were surrounded by fresh bamboo and necklaces of jasmine flowers. Crafted from high quality fragrance oil made with essential oils. Require no electricity and no monitoring of a flame. Alcohol Free, Parabens Free, Phthalates free, and CARB compliant. Bonus Tips Guide included with beautiful photography from around the world and tips to get the most out of your experience. 4 Oz (120 ml) Includes bottle, reeds, fragrance oil and decorative bottle top. Oil last for 3-4 months depending on the environment humidity, dust, temperature. CHIC GIFT SET FOR HER OR HIM: Makes a glamorous gift for weddings registry, housewarmings, birthdays, holidays, or a great alternative to bringing wine for a dinner party. MODERN HOME DÉCOR ACCENTS: Curate a fabulous first impression for guests. Indulge with the modern decorative glass bottle, great for office, kitchen & dining room, bedding & bath storage, or as a home fragrance accessories. ADJUST THE INTENSITY OF THE REED DIFFUSER FRAGRANCE OILS:Our essential oil reed diffuser reference guide shows you how to create the desired intensity of scent to fill any indoor room without overwhelming your senses. If you have any questions about this product by OOJRA, contact us by completing and submitting the form below. If you are looking for a specif part number, please include it with your message. Citronella Incense Cones with Burner Holder, Pack of 100 Pieces. (Free A Gift Wooden Key Chain Guitar Handmade).